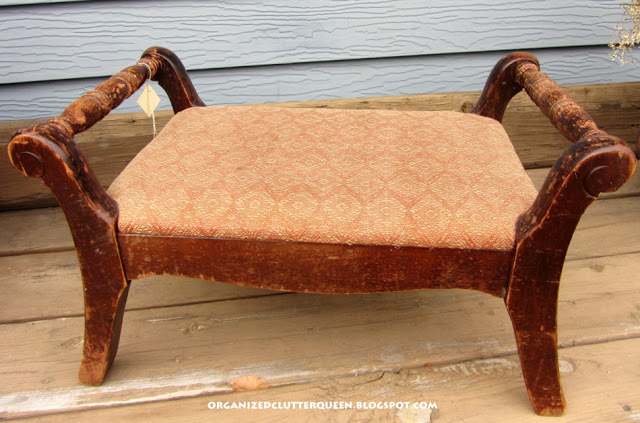 I purchased this vintage Tell City footstool several years ago at a local primitive occasional shop for $20. The finish was very worn and the fabric was faded and soiled. 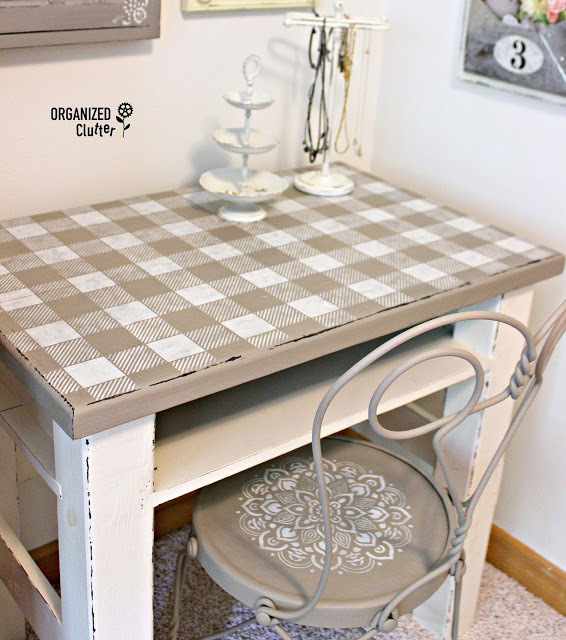 The first thing I did was to remove the old fabric and reupholster the top with burlap from Joann Fabric. This process was pretty easy. I pulled the burlap very tight and stapled it down with many staples. I folded the fabric tight at the corners. 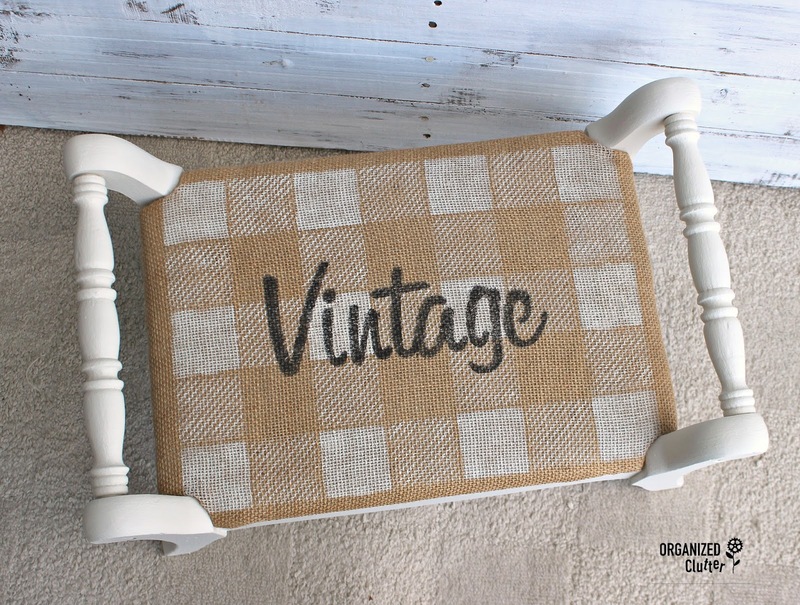 The footstool looked much better with the new burlap top, but I wanted a more trendy boutique look for my footstool. 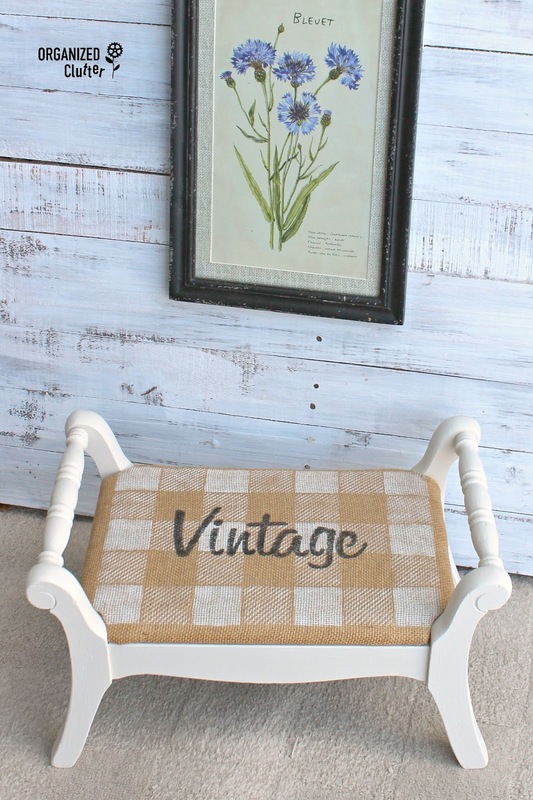 Luckily, my *Old Sign Stencils Buffalo Check stencil was the perfect size for the footstool top. I stenciled on the check pattern with Fusion Mineral Paint in Champlain , pouncing on the paint with a brush from the Dreamweaver Brush Set , after dabbing the brush pretty dry on a paper plate first. Here is the stenciled buffalo check burlap top. Next, I added Old Sign Stencils Market Extension "Vintage" with black acrylic craft paint. So far, my upcycle was going very WELL. But then, I also decided to paint the wood on the footstool. This part didn't go according to plan. I brushed on the Fusion Mineral Paint in Champlain, however dark pink popped up EVERYWHERE through the paint. I think the wood may be mahogany. I immediately brushed on Zinsser Bulls Eye Clear Shellac . Two coats, just to be safe. Wrong. Still pink popping through. Less, but still pink. Long story short, I may have brushed on 6 coats of shellac before NO PINK came through my paint. But, it was worth the trouble! 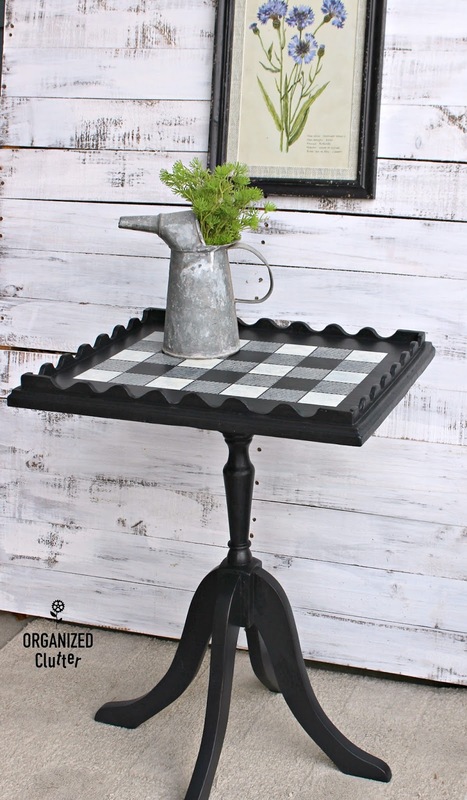 The footstool is boutique style fun! I didn't distress the piece at all. I like it just like this. Another great stencil/paint winner. Bleed through is so annoying - what always 'gets' me is the little 1" thin line of pink or reddish pink showing through when everything has been finished, waxed etc. Carlene, we love your little stool! 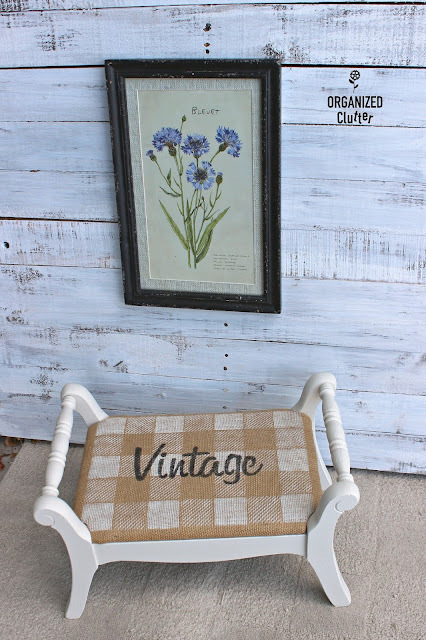 You did a great job with the buffalo plaid stencil on burlap. This would be darling on burlap pillows! You are so talented. Love your ideas. I think your little stool is darling! I truly love buffalo checks and buffalo checks in those colors. I made some drapes those color buffalo checks one time. That's one very sweet make-over, Carlene! That stool is just the cutest thing! Wow, that turned out so darn cute, Carlene! I love it. And I wouldn't have tho't to do what you did with the burlap in a million years. It took some persistence dealing with that pin bleed-through, too! I have never had such trouble with stain bleed. That is so cute Carlene! I love it. I have a piece that keeps bleeding through & I know I'm going to have to re-do it. Did you add the 6 coats of shellac over the areas you already painted, or did you sand or remove the paint first? No sanding. Shellacked over the paint.